Layouts Lab 3.3.3 – Templates for Keynote. 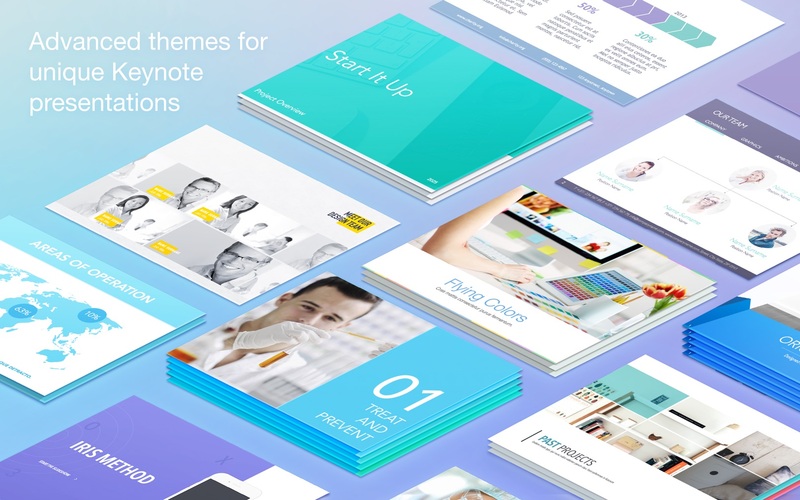 Layouts for Keynote (was Layout Lab, then was Presentation Lab for Keynote) is a collection of themes created for your unique slideshows by the Jumsoft design team. Outline your ideas, proposals, contracts, and solutions. Then, enhance them with stylish backgrounds, charts, diagrams, tables, and other data visualization elements to attain all you have been working for. Most objects can be easily recolored, reshaped, moved, or removed. You can change the background to a color, gradient, or photo with a simple modification in the appearance inspector. Type or paste your own text, add and remove text boxes, and change the fonts if you wish. Edit the charts and diagrams to fit your data. Drag your photos or pictures onto slides to replace the stock images. Use every available tool to make your audience hang on your every word. Next story VoodooPad 5.3.0 – Notepad with many advanced features. Previous story Maya LT 2019 – 3D modeling and animation tool designed for indie and mobile game development. Layouts Lab 3.2.3 – Templates for Keynote. Themes for MS PowerPoint by GN 4.0.3 – MS PowerPoint templates app.